Courtney Knox & Mario Ybarra, Texas Rx Card Representatives, presented a check to The Children’s Hospital of San Antonio Foundation, CHRISTUS Health. 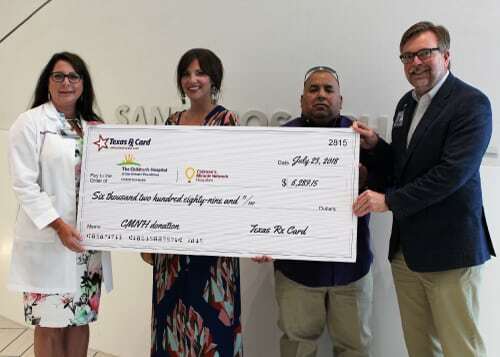 Ms. Rhonda Thompson, Chief Nursing Officer, The Children’s Hospital of San Antonio, and Mr. Terry Kyle, Vice President, The Children’s Hospital of San Antonio Foundation, were pleased to receive the check donation in the amount of $6,289.15. Following the presentation, Courtney & Mario were given a tour of the hospital by Gracie Martinez, Director, Children’s Miracle Network Hospitals. This donation is made possible through the Texas Rx Card prescription savings program. A donation is made to your local Texas CMN hospital each time a prescription is processed through the Texas Rx Card. Since 2015, the United Networks of America partnership with Children’s Miracle Network Hospitals has raised over $2.4 million dollars for local children’s hospitals. Of this, $6,289.15 has been raised for The Children’s Hospital of San Antonio Foundation, CHRISTUS Health. The Children’s Hospital of San Antonio Foundation was chartered in 1955 to carry out a vision: That every child in South Central Texas would receive the best available medical care, even if their parents could not pay. That noble calling remains the Foundation’s driving motivation. To date, we have raised tens of millions of dollars to cover treatment, research, programs and capital campaigns for building funds. These accomplishments stand as a testament to the power of your support, and to the goodwill and compassion of our community at large.